If you are looking to invest in a holiday home or villa in Florida, whether it be a buy-to-live or a buy-to-rent property, then you have certainly arrived at the right place. 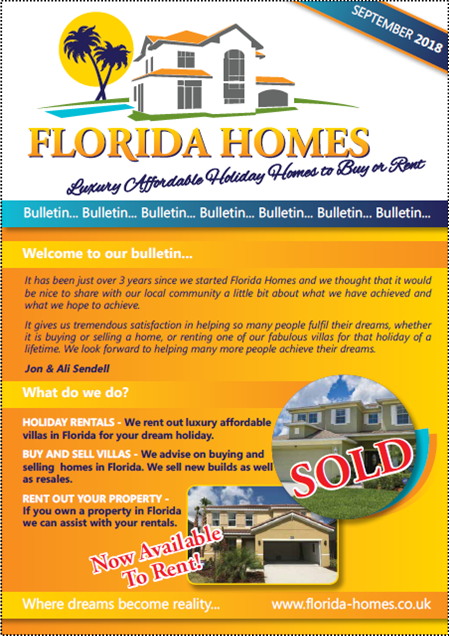 At Florida Homes we specialise in the sale, rental and management of property in Orlando, Florida. We understand that buying a home abroad is a big decision, but together with our trusted colleagues both in Orlando and here in Hampshire, UK, we will be with you every step of the way to ensure your experience runs smoothly. Please come and see us at our office in Chandlers Ford, close to Winchester and Southampton, where we can discuss your specific requirements and provide a personalised bespoke service. We also have a range of rental properties available in Orlando, close to Disney, and we offer a unique "try before you buy" scheme.